My computer knowledge has increased tenfold since starting this blog. I’m no wiz yet, but I can handle a little HTML now, and more importantly, yesterday I worked out how to rip 12”s to my computer. This can only be a good thing, and now allows me to get some of my rarer singles uploaded in addition to the CD albums… damn I’m good! I’m probably not going to make a regular habit of it as it did take me a while, but in response to a ‘conversation’ I had with Alley Al over at Biff Hop recently, I’m throwing up a couple of 12”s that may tickle your fancy. I remember copping this when it came out in 2000 after it received some pretty heavy rotation on MTV. 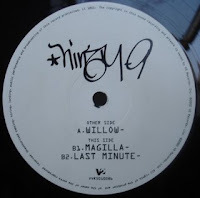 I know very little about Ninety9, but judging by Alley’s comments, she was a feature on the New York hip hop/spoken word scene around the mid to late ’90s and this ultimately resulted in the release of this pleasing, summery single. The lead track is ‘Willow’, a beautiful string and piano laced beat with sung chorus hook that feels great when the sun is shining and has the effect of making the world around you seem sweet. With lyrical references to an SP1200, you can also be assured that Ninety9 is representing the real hip hop. The b-sides aren’t too shabby either, my favourite being ‘Last Minute’ which has a seriously chilled, late night vibe. All in all, this is a pretty decent 12” from an artist who I would have liked to see a lot more of but who has sadly disappeared from the scene. I remember seeing Rahzel in my first year of university and being absolutely blown away by him and his DJ sidekick JS-1, so when this 12” dropped in 2002 I grabbed it without hesitation. ‘Beyond’ is an almost Premieresque (the man deserves his own adjective) beat with melodic piano loop and crispy drums that will get your head nodding, and O.C. comes correct on the vocal side of things. The two elements combined make for a quality, upbeat track that seems to have barely registered on the hip hop map. I’m not a great fan of the b-side, although there is no doubting that JS-1 can work his way around the boards. Ultimately, whenever I used to buy 12” singles, one side would always predominate and leave the other in the shade and in this case, ‘Arrogant’ takes the fall. 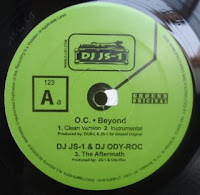 The 12” also includes a DJ track featuring DJ ODY-ROC, who I have never heard of before, but the pair perform some seriously tight scratching over a relatively aggressive beat that makes several transitions over its five and a half minute duration. Overall, a quality 12” that demands you hit the link. Although the vast scale of hip hop means that the music is inevitably broken down into numerous sub-genres, the category of ‘Christian Hip Hop’ has always filled me with a vague sense of dread. The thought of somebody ramming their religious ideologies down my throat is not exactly desirable, and as such, the tag often has the effect of putting me off a work. 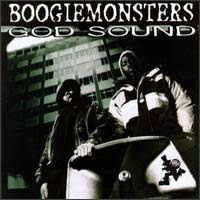 The Boogiemonsters do fall into this sub-genre, and the religious aspect is more present on their second release ‘God Sound’ than on their classic debut, but it avoids being overly preachy and although it is not an astonishing album, it is well worth a listen. The group are perhaps best well known for their single ‘Recognized Thresholds of Negative Stress’ and deservedly so. This is a fine example of mid ’90s hip hop at its best, and although it was the clear album highlight, the rest of the release kept pace with a chilled, summery vibe and well delivered verses. Their sophomore release is definitely not as strong, losing the sense of fun that categorised the first album in favour of a darker, more monochrome sound, but in places this does work well. ‘The Beginning Of The End’ has some tight rolling drums and brooding samples that make for an effective album opener. ‘Whoever You Are’ has a spacious feel and some atmospheric strings, and ‘Whistles In The Wind’ has a seriously laid back flava with echoing rim hits and, you guessed it, some whistling. These tracks are the highlights for me, and I rarely delve much deeper into the album. The beats lack impact overall and I do not feel that there is enough to keep a listener engaged properly over the album in its entirety. MCs Vex and Mondo are effective on the mic, with nice flows and intelligent lyrics, but as with some of the beats, there is something lacking here that means my attention is not completely held. Don’t get me wrong, their deliveries are accomplished, but if you asked me to detail their work content-wise, I would struggle to tell you as the verses do not demand that you take notice. There are of course references to their religious beliefs, but thankfully these do not feel overly preachy and avoid detracting from the quality of the album in some places, although as already mentioned, this is rather spasmodic. If you are expecting something as good as ‘The Underwater Album’ then you will be inevitably disappointed, but there are moments on ‘God Sound’ that warrant a good listen. This is intelligent hip hop that despite its shortcomings will reward you in small doses. Enjoy. When I was thinking about a name for this blog back in December, I didn’t really labour over the task too heavily. I knew I wanted to reference the first LOTUG album in some way as it holds a special place in my heart, and I also wanted something that sounded good. Whether I achieved the latter or not is down to personal opinion, but I still like it and I enjoy the fact that it hints towards the urban nature of the genre (bricks = buildings, get it?!). What I didn’t really consider was the reference to Jersey (Newark is ‘The Brick City’), and it is only really as a by-product of writing this blog that I have fully realised the significance of ‘Da Bricks’ within the culture as a whole. Redman, Naughty, Artifacts… the list goes on. Of course, I wasn’t unaware of its role in hip hop, but I just hadn’t really thought about it that much and given it the full credit that it deserves. With this in mind, today’s post focuses on Miilkbone, a Jersey resident whose debut release ‘Da Miilkrate’ seems to get overlooked despite a satisfying combination of beats and rhymes. 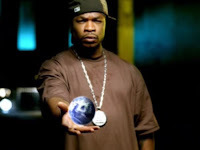 A Naughty By Nature affiliate, it is no surprise to see Kay Gee popping up on the production credits a number of times, and generally speaking, the beats are solid with a classic mid ’90s flava: big drums and well chosen samples. Mufi is the lead producer on the album, putting together no less than seven of the cuts here, and this surprises me as he is a relatively unknown entity whose only other major production credit is on Queen Latifah’s Grammy winning track ‘U.N.I.T.Y.’. Highlights for me are ‘Keep It Real’ with its jazzy piano sample (the remix is also excellent), ‘Move Wit’ Da Groove’ which has a real ‘party in the summer’ vibe and ‘Check Me Out’ that features some classic sleigh bells and an enjoyably broody soundscape. This is not to say that the production is exceptional as there is some filler here, and I do find myself reaching for the skip button on a number of occasions when listening to the whole album: they’re not awful, but some of the beats lack punch and are easily forgotten. Miilkbone can handle his business on the mic, with a flow reminiscent of his Naughty By Nature affiliates but without the finesse that make Treach and Vinnie so engaging. The lyrical content essentially falls back on the staple diet of boasts, brags and parties, but he carries the style off well enough over the course of the album. What really grates for me is his relatively consistent reference to the colour of his skin, and many of the skits revolve around the idea of his rejection of the ‘traditional roles of the white male’ as a result of growing up ‘next to the projects… with just flat out hoods’. If Miilk was so keen to prove that the colour of his skin was irrelevant to his music, then why the hell did he choose to bang on about it all the time? The irritatingly simplistic vision that he puts forward with regards to notions of race and identity in hip hop end up coming off as superficial at best, and at their worst, highly ignorant. Perhaps this is overly harsh given that this was released in ’96 when issues of colour in relation to hip hop had not been addressed in the same depth that they have been in more recent times, but there is no doubt that these overly earnest ‘justifications’ of his place within the genre feel heavily played out over the album in its entirety. However, putting this issue to one side is worthwhile, as ‘Da Miilkrate’ is a solid release that contains enough highlights to keep the majority of heads happy. Don’t expect to be blown away, but in places this will have your head nodding and feet tapping: show Jersey some props and hit the link. 17. Common – I Used To Love H.E.R. 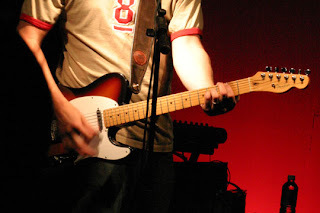 What I love about a good guitar sample is that it clearly harks back to hip hop’s foundations in funk, and as a result, tunes that utilise them often have an upbeat and positive vibe that feels fitting as we head into Spring (finger’s crossed) in the UK. Although I’m not going to break this down song by song, there are a few cuts here that deserve a special mention. I’ve already commented on P.A.’s ‘I Miss 1994’ release on FDB, but given that I have been killing the intro so regularly of late, I felt it fitting to kick off the compilation with the album opener, ‘Incistroduction’. Although the release as a whole is not mind-blowing, I think this beat is excellent and does a good job of incorporating a mellow guitar loop into a heavy beat. Oktober’s ‘NYC’ is a straight up banger off his ‘Projekt: Building’ release which in all honesty I was a little disappointed with, but there is no question that this joint has that infectious head nodding factor that should appeal to the majority of readers here at FDB. Finally, Ultimate Force’s ‘C’mon’ is off their shelved album ‘I’m Not Playin” that sees an official release at the end of this month: 1990, Diamond D production… need I say more? Get it when it drops. All in, I’m pretty happy with this compilation and indeed the series as a whole (I’ve included the links for all four in case you missed them first time around), and I hope to continue with this idea in the future, time-permitting. If you’re feeling it, drop a comment and I may just set aside a bit of time to do the series justice over the coming months… it’s in your hands. As with the other FDB compilations, I’m taking the opportunity to throw up something a little different that falls in line with the theme of the mix. Nick Drake has garnered a massive cult following here in the UK, perhaps in part due to his tragic and untimely death, but also because his music is of such beauty that it still holds resonance close to 40 years after its initial composition. I remember seeing ‘Pink Moon’ at the top of numerous music press lists of ‘great albums that never make the top 100 albums lists’ and as a result I bought it in my third year of university. Drake suffered from depression, and it is said that he recorded this album facing a wall during late-night solitary sessions only to walk into Island records one day and dump it on their desk. This is reflected in the album’s stripped down purity: this is largely Drake’s voice, his guitar and little else. I’m not usually a massive fan of folk, but this is undeniably beautiful music that I strongly recommend. It’s pretty far removed from hip hop and may not be your bag: give it a try and let me know. Next up from myself, we have three 12”s featuring purely Canadian artists. Canadian hip hop is as good, and sometimes better, than stuff from the neighbouring USA, and can easily live up to the hype. The 12”s I have picked are representative of the scene here, at least of when the music featured was produced. As with the genre in general nowadays, jiggy club music is preferred, but these 12”s are far from that. Second up, a great 12″ by a crew out of Toronto called ‘Ghetto Concept’. 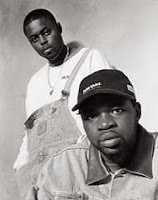 Ghetto Concept are Kwajo and Dolo, who met in 1989 and went on to release 12”s and albums under this guise. 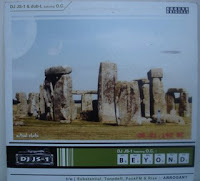 This 12” was released in 1992. Deifitrec b/w Certified is one of those 12”s that never leaves rotation: timeless! You can hear the 1992 vibe in this record, the beats are jazz-sampling simple creations, with the two MCs trading bars back and forth. They have a great vibe to them and it fits right in with the era: call and response, rapping and singing the hooks, and always sounding like they are having fun. The ‘Certified’ remix is my favourite. Deifitrec is also a good cut, but i prefer the other side. I actually featured this 12” in one of my mixes so check out their other stuff if you like this, it’s sure to be of the same standard. Lastly, a great 12″ featuring two different artists and tracks: Saukrates with ‘Father Time’ and Choclair with ’21 years’. The two cuts make for a a solid 12″ from the days of indie hip hop. Saukrates represents Toronto, and this piano laced beat works perfectly with his rhymes. 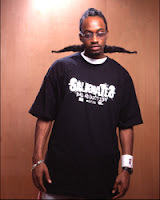 Saukrates is probably one of the most widely known rappers from Canada; his ‘Brick House’ EP features artists like Common which deomnstrates how respected he is as an MC. The best cut on this 12″, however, is from Choclair. 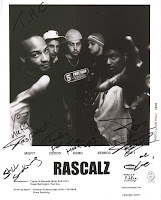 Featured on DJ Premier’s ‘New York Reality Check 101’, it is an understated piece of work – a simple, bassline driven beat with Choclair and the pianos working well together to produce a great indie masterpiece; as mentioned previously, if DJ Premier likes it, you’re onto a winner. Choclair had an album come out a few years back but it wasn’t to my liking. I know that a few 12”s earlier were good, so check those out. For now, this is the 12″ for me!